Time took to read: ? I deeply loved this book... How could I not?? Jane Austen is a master mind when it comes to weaving a plot and incorporating believable characters... This was a great book and I give it full marks for everything... I just wish I had read it all in a shorter period of time... But all in all I LOVED it... I recommend it to all Jane Austen fans..
Before she began the novel, Austen wrote, "I am going to take a heroine whom no-one but myself will much like." 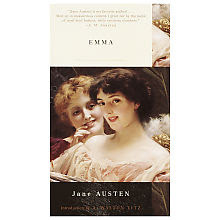 In the very first sentence she introduces the title character as "Emma Woodhouse, handsome, clever, and rich." Emma, however, is also rather spoiled; she greatly overestimates her own matchmaking abilities; and she is blind to the dangers of meddling in other people's lives and is often mistaken about the meanings of others' actions. I loved that plot description. Might i be able to use it as mine? You could of, but you were not patient enough!!!! heehehehe... no... you can always use stuff like that for your blog... anytime... Though I think it was nice of you to ask. You know when ever on my computer i come on your blog it always acts crazy!!! I really need to get my computer fixed! Ha!!! Well i took me so long to even comment. But i think it was worth it.